By The Light Of The Silvery Moon. The music, first published in 1907 or 1909* was written by Gus Edwards and the lyrics by Edward Madden. 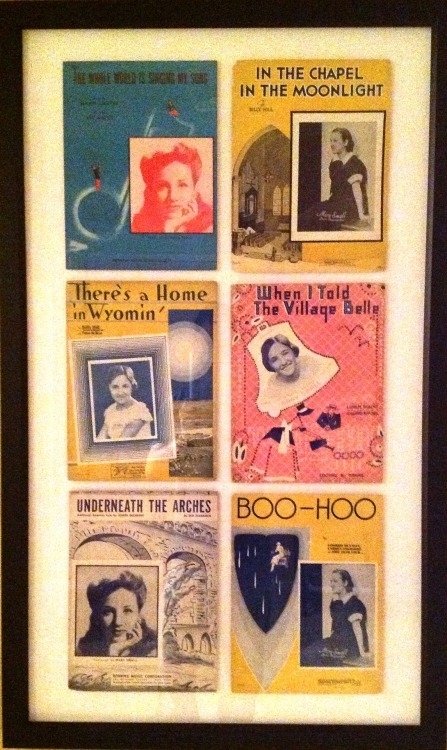 I’ve found dozens of sheet music titles like this with Mary’s face on them from 1934 through to the late 50’s. In a way, standards were like cover songs and “popular” in some cases half a century or more. While radio and home playback devices were introduced to the public at roughly the same time, early on it was radio with the biggest audience and when people wanted to hear music… sometimes they played it themselves, in their living rooms, and entertained… each other. That’s why sheet music like this one is so common, it was mass produced for the casual musician, not just bands. People associated the song with the singer they heard introduce it on the radio. In the case of this particular song, it is still sung and recorded to this day. To give you an idea of one stretch, here are two examples of the song, one from 1912 and another by Little Richard, possibly from 1957, so a good 45 years apart. 1912 Ada Jones sings “By the Light of the Silvery Moon on an Edison Blue Amberol Cylinder Record #1521. The Phonograph is An Amberola V, which was one of the Larger Table Model internal horn Edison Phonographs with a unique motor and governor mechanism and the only Table Model Amberola with an automatic shut off feature. Place park, scene dark, silvery moon is shining through the trees; Cast two, me, you, sound of kisses floating on the breeze. Act one, begun. Dialogue, "Where would you like to spoon?” My cue, with you, underneath the silvery moon. By the light of the silvery moon, I want to spoon, to my honey I’ll croon love’s tune, Honeymoon keep a-shining in June, Your silvery beams will bring love dreams, we’ll be cuddling soon, By the silvery moon. Act two, scene new, roses blooming all around the place; Cast three, you, me, Preacher with a solemn looking face. Choir sings, bell rings, Preacher: “You are wed for evermore.” Act two, all through, every night the same encore. By the light, (By the light, By the light), Of the silvery moon, (The silvery moon). I want to spoon, (Want to spoon, Want to spoon) To my honey I’ll croon love’s tune. Honeymoon, (Honeymoon, Honeymoon), Keep a-shining in June. (Keep a-shining in June) Your silvery beams will bring love dreams, We’ll be cuddling soon, By the silvery moon. Your silvery beams will bring love dreams, We’ll be cuddling soon, By the silvery moon. (The silvery moon).